Claire Marin's maddeningly delicious chocolates are infused with raw honey from her own bees. Three hours' drive north of NYC, in a town with 12 people per square mile, former Manhattan-based magazine publisher Claire Marin keeps bees. In late summer, she gathers their honey and infuses it, raw, into her award-winning rye whiskey. In mid-autumn, when the bees are feeding on chestnut, maple, and wildflowers, she harvests a darker honey. 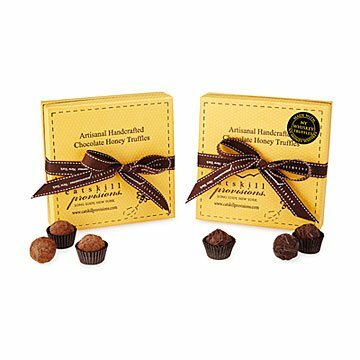 Her exquisite, handcrafted bittersweet truffles, made of 70% Belgian chocolate, have velvety ganache centers, some infused with honey whiskey, the others with raw dark honey. There's one box of each. A final cocoa powder dusting, and—wait, where'd you go? Oh. Never mind. We know. Handmade in New York. Born in Madrid and raised in New York City from the age of fourteen, Claire Marin was a successful women’s magazine publisher in her previous life. One day, she gave her partner a bee hive—and fell in love herself with the community-oriented society of honeybees. After keeping bees as a hobby for six years, she left her high-powered Manhattan career to manage hives in a tiny Catskill Mountains town. Within a few years, she was co-managing 300 of them, and had started a company to sell honey. Following the example of the bees she so admires, she began building her own community-oriented business with resources close at hand—the hives, maple trees, and local farmers of upstate New York. I bought this for my dad - a whisky connoisseur - for Father's Day, and he absolutely raved over them!